National Weather Service Chicago Servers Overloaded, Drudge Report? National Weather Service Chicago web servers were not available or were extremely slow about 8:30 p.m. Sunday. The popular news site Drudge Report featured the Blizzard Watch by linking Chicago snow headlines to National Weather Service Chicago weather alert pages — the Winter Weather Briefing page and the Blizzard Watch page. Both pages were not accessible at 8:30 p.m. Sunday. Drudge Report is known for generating a high number of referrals from the website’s headline stories. It wouldn’t be the first time the referrals caused a web host to slow to a crawl. No word yet on what caused the server overload. 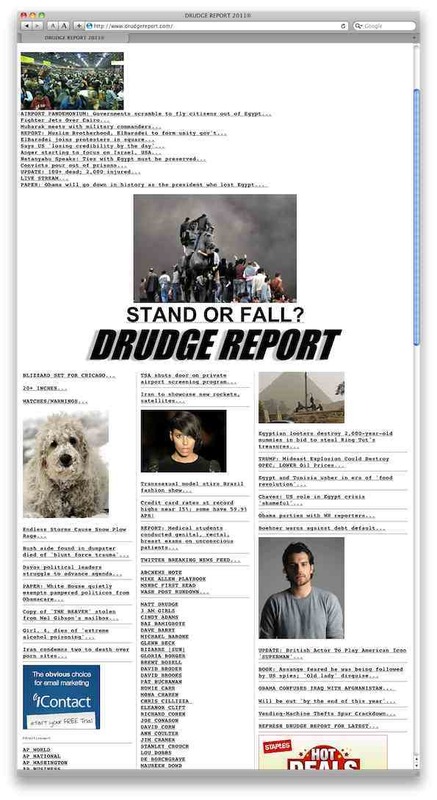 Links to NWS shown in the left column of the Drudge Report. ← Ground Hog Day Blizzard: How Much Snow Do We Need to Beat a Chicago Snow Record?